Throughout our time here in Thailand so far, I’ve noticed how different the markets and interactions between consumers and vendors are from the United States. The most prevalent difference is the presence of open air markets. These take the form of food markets (mostly for those living here) and markets like the Night Bazaar catered to the tourism sector. By looking at the differences between these two markets, one can see a huge differentiator between American and Thai culture: materialism. Although we all already know that we as Americans value material things, it’s amazing how the people of Thailand have come to not only accept this difference in the people who come to their country, they capitalize on it. The entire Night Bazaar is catered to the things that tourists buy and want in souvenirs. Tourists spend tons of time walking around and bartering with the vendors to buy the things they sell. In comparison, the food markets that people who live here shop at are for necessities. We also saw from the elderly home and the Hmong village that people live much more simply and with a lot less. 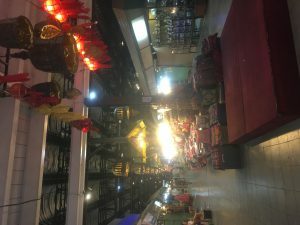 The sociocultural aspects are much different between Thailand and the United States; and the Night Bazaar shows how Thailand has come to realize this difference and the people can use it to their advantage. The human-built environment in the form of markets catering to tourists allow us to see the difference in business in general between the two countries. There are few regulations in Thailand, and prices aren’t fixed in stores or areas – you barter. The appeal of the products in Thailand (beyond the price) is that a lot of them are crafts also. This is a huge trend in the United States, so it’s also popular in other countries to bring back handmade trinkets. The United States has farmers markets, but they have tons of rules and specified times when they can take place in a specific area, so the markets here are very different overall. Consumerism here in Thailand is very different from the United States; Thai people don’t shop or buy extra things like Americans do, they live much more simply and they don’t necessarily need as many rules and regulation on businesses because the vendors are not greedy in the same way American business owners are. I liked how you noticed the difference in consumerism in Thailand compared to the U.S. I agree with the point that you mentioned how Thai people live more simply and purchase goods based on necessity rather than to splurge and hoard. It does trigger some kind of emotion in me when I see old men and women working at the night markets to sell and rely on tourism to earn a living through crafts and markets and how bargaining has become a norm here, rather than keeping a standard price for goods like in the U.S.
You’ve voiced a lot of my feelings towards the growing consumerist catering that is played out in the market. I am not sure whether indulging American/tourist expectations for Thai culture is a positive direction for preserving traditional culture. I don’t have any answers towards reversing it or whether we need to necessarily do something about it, but I think recognising this is important. At least Thai society seems to not widely buy into the market beyond selling goods there. I really enjoyed your post Taylor. Although I noticed the difference in the markets, I did not think of Thai people’s spending as a way of living life simply. This post definitely allowed me to step back and even encouraged me to not just be a tourist who buys fancy Thai things. Taylor, Excellent writing, like a lightbeam illuminating markets. Its curious to consider greed as the motivator of regulation, in light of what we experience in the markets. Thank you.